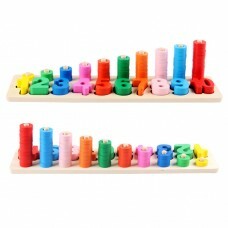 A range of educational wooden toys in our alphabet and number section. Most are available personalised in the name of your choice. 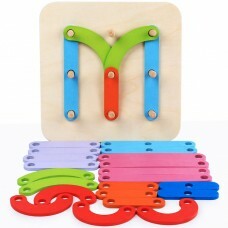 Learning about letters and words is made easy with this wooden lift out puzzle. 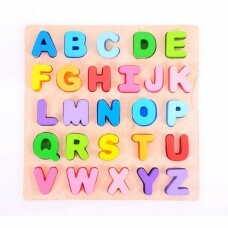 Each brightly coloured wooden lower case letter slots into the base board, where there is a suggested word and image for each one printed into its slot e.g. t for train. Each chunky wooden puzzle piece is generously sized to make it easier for little hands to lift, grasp, examine and replace. Helps to develop dext..
A new Hometime Crafts design for April, this colourful number tray puzzle is cut into the shape shape of a caterpillar and has raised puzzle pieces which makes it easier for a child to grip. Dots have been added under each segment to aid the child in putting each piece back in the correct place. 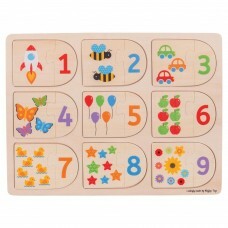 An ideal puzzle for developing number recognition, counting, hand-eye coordination and colour.. 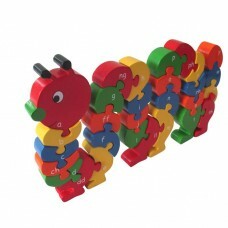 This large 29 piece freestanding wooden caterpillar jigsaw is designed by Hometime Crafts with a letter from the Welsh alphabet added to each piece on the front. A great wooden toy for helping to learn the Welsh alphabet. It's made out of chunky wood so that it can stand on a shelf in a child's bedroom or playroom. We have colour co-ordinated the design so that each jigsaw piece/letter can be add..
Great educational wooden alphabet tray puzzle, the puzzle has chunky 1.5cm thick capital letters which stand proud of the tray, this enables the child to remove and place back the letters with ease. 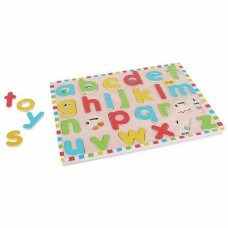 The tray puzzle can be used to learn the English alphabet, the letters can also be used to make simple words. 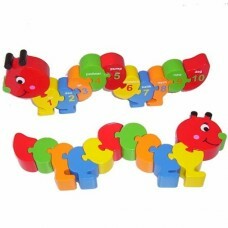 Each individual letter is colour co-ordinated with its base slot to ..
A new Hometime Crafts design for April 2013, this brightly coloured free standing caterpillar number jigsaw in Welsh. The chunky jigsaw pieces are easy for the child to grip, the caterpillar even looks great on a shelf in a child's playroom, bedroom, etc. The jigsaw colours of red, yellow, blue, orange and green are in sequence to help with not only colour recognition but also..
A great number jigsaw in Welsh, a novel and fun way to learn how to count. Each number will only fit into the piece with the equivalent number of animals e.g. the number 2 will only link to the 2 elephants. 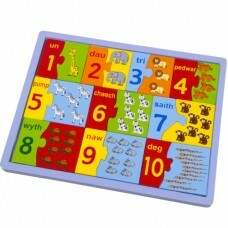 A bright and colourful educational jigsaw presented in a personalised wooden tray. Size: 32.5cm long x 26cm wide x 1.5cm deep. Age 3+ *We can offer this product to retail outlets, schools, ..
A fun and fascinating introduction to matching numbers, shapes and pictures! Each of the nine puzzle slots has two wooden pieces which connect, with the corresponding number of dots printed onto the wooden base board. 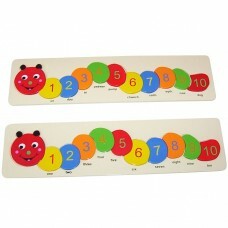 Helps to develop counting and numerical skills. Each chunky wooden puzzle piece is generously sized to make it easier for little hands to lift, grasp, examine and replace. Helps to d..
A great educational wooden puzzle board for developing hand to eye co-ordination, letter and number recognition. The box contains a wooden board with pegs and 26 different size, shape and coloured pieces which can be used to make up different letters, numbers and shapes. Also provided is a useful information leaflet showing how the pieces can be used to make up different letters and numbers.We can..
A great educational wooden number puzzle and stacking toy. Learn to count by matching the number to the correct slot in the base and then count the brightly coloured rings as they are placed on the pegs. Helps to develop dexterity and concentration, a fun introduction to mathematics and counting skills.Size: 40cm long x 10cm wide x 10cm highAge 3+..